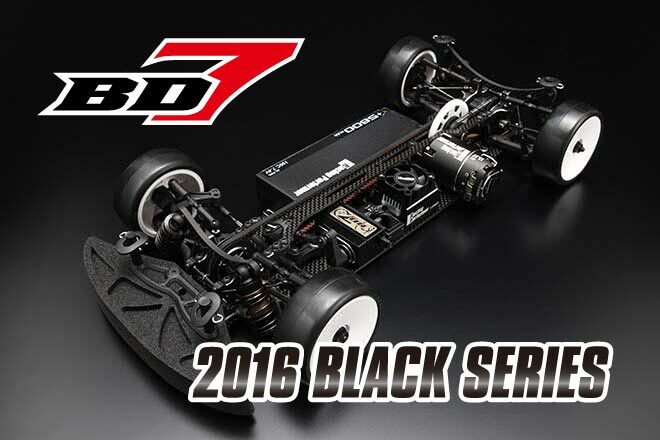 Yokomo Japan has released detailed info on the new 2016 BD7. It looks very interesting with a fair few changes to the previous iterations. It seems that low is the way to go for their design team. Here are the pictures and translated info from the Yokomo site. Fate imposed on those who continue to run the top, it is that it aims to further heights. 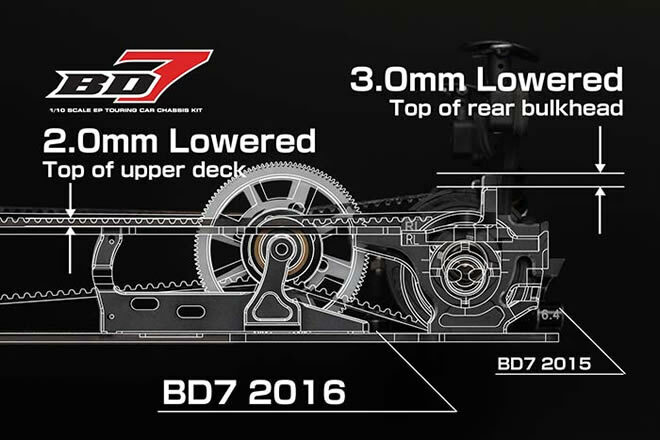 BD7 challenge to 2016, overcame a big wall to which it has been built up to now, was to improve both the speed and drivability. 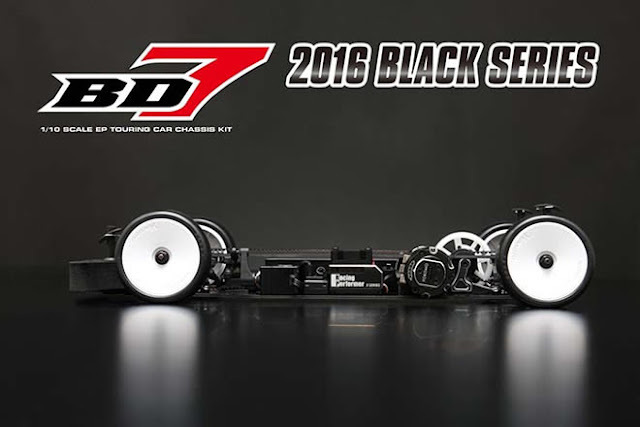 World Champion machine BD7 series development that the worked chief mechanic, Umino Kojiro has been painted of the keyword "ultra-low center of gravity". Without having to give a treat to the performance that has been polished in the top of the world of racing scene, it was a bold idea further review fundamentally the machine that had played an already low center of gravity. 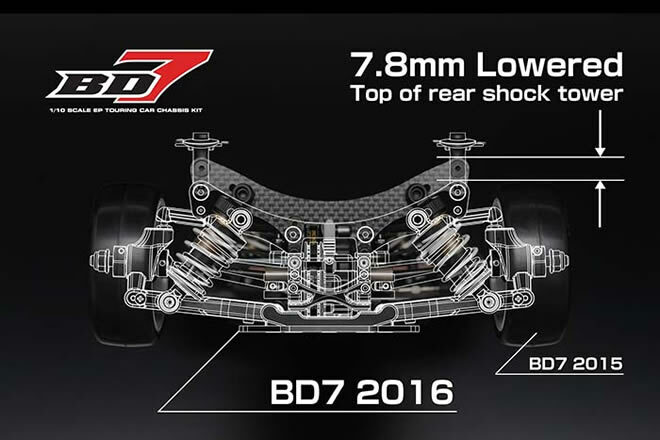 The diameter of the front and back Defupuri derived from elaborate test is brought, the more equipped with low each part that make up the chassis, ultra-low center of gravity design that allows an overwhelming cornering speed. Further that the diameter and weight of Defupuri is reduced, also exercise the performance of the machine to reduce the gyroscopic effect improved, and added that throttle response is also best, it was a choice that makes sense in many ways. To fit them even shorter overall length shock, and ensure a sufficient damping force can be large diameter. 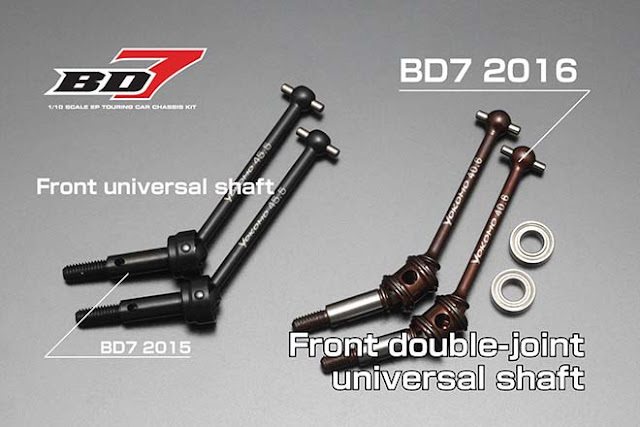 Front universal standard with double-joint type in, is also thorough race measures. Of course they are in the selection, which is obtained form precisely because ultra-high-precision chassis of BD7, was thoroughly refined every single part, no exaggeration to say that the realization of the design concept, which is sublimated under perfect balance. Position of the center of gravity in terms of talking about car handling and driving stability has the most important meaning. As the center of gravity is low, roll, reduces the load shift amount due to pitch, and the load shift amount decreases less ground load variation of the individual tires, for attitude change can be suppressed, the response rate to the calm and driving behavior You can be both. It and the reverse in the center of gravity is high (current company touring car), to become necessary to take measures such as to strengthen the shock and stabilizer in order to reduce the roll and pitch, difficult to follow, such as the gap of the road surface, and high-speed / In the high grip of using it in recent years of touring car racing scene, it is becoming difficult to stabilize the behavior of the machine. BD7 2016 will again review the basic performance, by building up ever accumulated know-how, we have played a step-up of amazing. 6mm diameter of the front and back of the drive pulley, drive axle center 3mm now low. This reduced gyro effect rotating object causes (the effect of direction is less likely to change in the rotation axis) at the time of traveling, especially for the movement of the roll direction becomes better, it enables sharp cornering and crosscut. Furthermore also slot response improved by weight reduction of the pulley. It brings a good effect on acceleration and fuel consumption at the time of the corner escape. Front and rear bulkhead, which accounts for a large weight of the parts that make up the chassis, 3mm Lowdown in upper bulkhead top. Upper Deck also down 2mm, we are greatly contributed to the overall low center of gravity.By the center of gravity is lowered for the roll center, excessive roll is reduced at the time of running at high grip.In particular, over grip trend of strong recent race scene, the effect is high in the high-side prevention, of course, because that can be done is setting in not too dependent on the stabilizer, it is possible to finish a more neutral steering characteristics. We are contributing to the low center of gravity by also shock tower in the highest position to Lowdown. BD7 7.8mm lower than the 2015 standards of the rear shock tower, conventionally it fell significantly and even minus 5.3mm compared to the short shocks specification was optional settings. Shock Short has become the standard equipment. 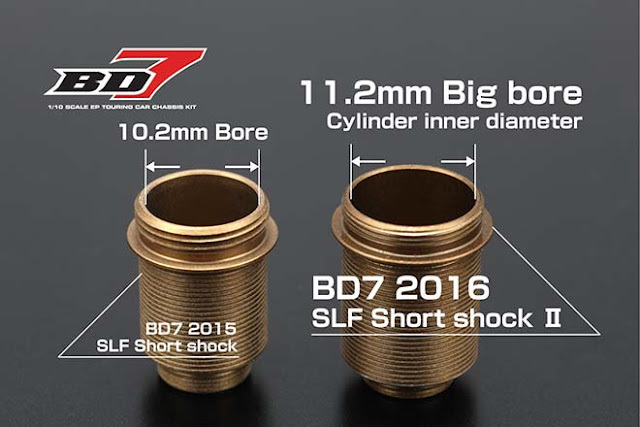 Short shock is not only to reduce the overall length, large capacity up by extending the cylinder inner diameter.New super low friction short shock "II" is expanding the cylinder bore from a conventional 10.2mm to 11.2mm, are you greatly capacity up than the older short shock, of course, it has been a large-capacity ever than Yokomo SLF standard size and plays a capacity of about 20%. Although operation feeling was said to be the peaky by previously to be short of, it received a request for a suspension growing along with the SLF short shock "II" in the high-speed reduction, brings a high steering stability. Moreover, it reduces the viscosity change due to heat during the travel by capacity, also leads to a height of stability that characteristic changes in the race is reduced. Front double joint universal shaft to keep the drive loss at the time of the steering operation is now standard equipment. 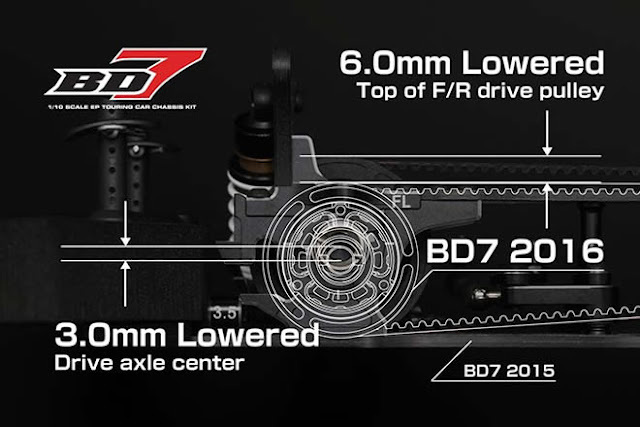 At the time of running at the front solid axle is the current mainstream of driving style, there is a tendency that the steering angle at the time of cornering is increased, now often stall feeling can be felt. BD7 the double joint universal shaft also said indispensable item of the 2016 racing By standard equipment, and plays to improve the natural turn-in and cornering speed. In addition, due to this standard equipment, sold separately price of double joint universal shaft also we price cut to \ 4,980 (tax not included). ※ The photograph is an assembly reference example. Controller class in the kit, the battery does not include tire / wheel, body, pinion gear and the like. Please purchase separately. The kit does not include body, wheels, tires, motor, batteries, pinion gear, and other R / C electrics.